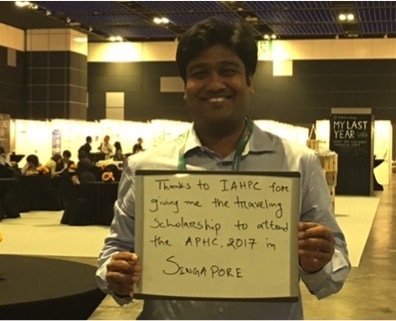 Dr. Fazle-noor Biswas, a clinical pharmacist in Dhaka, Bangladesh, used his Traveling Scholarship to attend the 12th Asia Pacific Hospice Conference in Singapore last July. This is his report. Palliative care is relatively new in Bangladesh, where many health care professionals and community members do not understand the concept or the importance of total care for patients with life-limiting conditions. Yet we know that an estimated 600,000 people at any one time could benefit from palliative care here. It is also a big challenge for us to ensure community participation, which is key to long-term sustainability of palliative care services. The new knowledge, ideas, and skills I learned at the conference will help me to overcome these barriers. I have definitely improved my daily clinical practices of patient care, communication and teamwork, as well as defining my role and responsibilities as a palliative care pharmacist. This new knowledge helps improve the total care pathway. I learned many new things at informative sessions that will help improve my daily practice. I attended sessions on advanced management in breathlessness, anorexia management, neuropathic pain management, step 4 of the World Health Organization analgesic ladder, burdens of a caregiver, art therapy, community participation in palliative care, and statistics of opioid use in the world. A particularly interesting session was about palliative outcome measurement tools, presented by Dr. Ping Guo. Another important reason for my attendance at this conference was to participate in a workshop on: 'The Role of Pharmacist in Palliative Care.' Working as a hospital or clinical pharmacist at any hospital setting is not a popular job in Bangladesh. There is little available scope of pharmacy practice here. A big challenge for me as a pharmacist is to develop the role of the specialized clinical pharmacist in palliative care. The workshop helped me to improve my clinical pharmacy practice by learning more about the role and responsibilities of a palliative care pharmacist. I took the opportunity to renew my individual membership with both Asia Pacific Hospice Network and IAHPC. I want to thank the IAHPC — it would have been impossible for me to afford the conference without the Traveling Scholarship, which covered my flight, accommodations, and local transit costs. IAHPC’s Program Support Grants support projects and individuals around the world, especially in developing countries in Africa, Eastern Europe, Asia, and Latin America. For information about our Traveling Scholarships and Traveling Fellowships, or to apply for one, please visit our website. You can also contribute to this program and help palliative care workers attend and participate in congresses and courses by donating to the Traveling Scholarships Campaign in the Global Giving website.